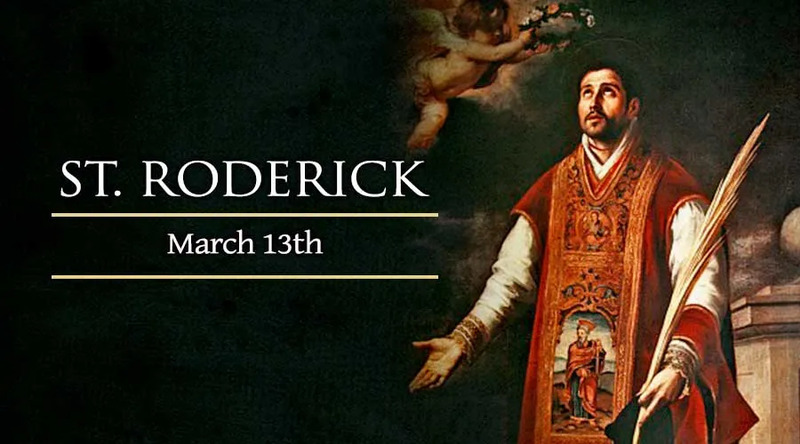 Roderick, also known as Ruderic, was a priest in Cabra, Spain during the persecution of Christians by the Moors. Roderick had two brothers, one was a Muslim and the other, a fallen-away Catholic. One day, he tried to stop an argument between his two brothers. However, his brothers turned on him and as a result he was beaten into unconsciousness. The Muslim brother then paraded Roderick through the streets proclaiming that he wished to become a Muslim. His brother also told the authorities that Roderick had converted to Islam. When Roderic awoke, he renounced his brothers story and told the authorities of his loyalty to the Catholic faith. The authorities accused Roderick of apostacy under Sharia Law and he was imprisoned.While in prison, he met a man named Solomon, also charged with apostasy. After a long imprisonment, they were both beheaded.